No-Evil.net's "Microwave vs. Cell Phone" video attracts over 4 million viewers angry about cell phone bills. Popcorn-popping cell phones aren't the only viral cell phone videos sweeping the Internet. 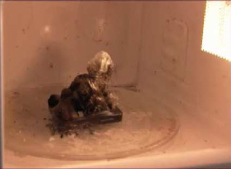 A new viral cell phone video - "Microwave vs. Cell Phone" - illustrating the "evil" nature of cell phones is mesmerizing the Internet and unleashing consumer rage against their cell phone carriers like never before. 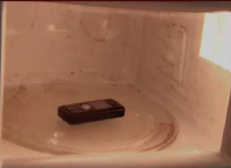 In the widely seen 56-second video, created by http://www.no-evil.net, a cell phone placed into a microwave unexpectedly unleashes a terrifying monster a la "Alien." Audiences are clearly sympathetic: The clip was the most-viewed video on MySpace for the week of June 2, 2008. Since the "Microwave vs. Cell Phone" video was posted on May 31, 2008, more than four million people have viewed it on YouTube, MySpace and Break, among other sites. The video's surprise ending - clearly a metaphor for the intense ambivalence people feel toward their cell companies - has evoked so much emotion that a staggering 14,000 viewers to date have posted heated comments about it. The video is the work of Net10, the fastest growing new cell phone company in the US. Net10, whose brand slogan is "No Bills, No Contracts, No Evil," is hardly surprised by the cult status the video has achieved -- or by the strong negative emotions people continue to harbor toward its competitors. "There are so many ways that post-paid cell phone providers carry out negative practices," said Derek Hewitt, Sr. V.P., marketing for Tracfone Wireless. "Hidden charges, over billing, long-term contracts and exorbitant fees for early cancellation are a few of the ways post-paid cell phone providers take advantage of their customers." Judging by the response generated from the "Microwave vs. Cell Phone" video, American consumers agree. The Net10-created Web site http://www.no-evil.net is a compendium of sins perpetuated by large cell phone providers against their customers. Visitors to the Web site can find, among other things, a detailed list of the many ways that these companies are ripping off their customers. There is even a place on the Web site for victims of cell phone service abuse to air their horror stories. And for those who just can't wait for their cell phone contract to end, the Web site will even find someone to buy out your contract for you. By contrast, NET10 is founded on honesty and simplicity. The nationwide service provides calls at 10 cents per minute, 15 cents for overseas calls to over 60 destinations, and 5 cents for text messages. There are no bills, contracts, overages, hidden daily or monthly fees or any of the surprise other charges that enrage customers of traditional cell phone companies. Net10 is available in over 50,000 stores nationwide, including Walmart, Target, Circuit City, Kmart and Family Dollar. To watch or download the "Microwave vs. Cell Phone" video that's creating a viral stir among millions of viewers and inciting a backlash against "evil" cell phone practices, visit http://www.no-evil.net. Click on the "Share" button to download this video in various formats. Net10 is a brand of TracFone Wireless Inc., the largest prepaid mobile phone service provider in the U.S., for the 12 years since it was founded. TracFone is a subsidiary of America Movil (NYSE:AMX), the fourth largest mobile phone company in the world, and the largest in all of the Americas with more than 153 million mobile phone subscribers - more than AT&T, Verizon or Sprint. For more information, visit http://www.tracfone.com.